I blurted out, “That is sitting in my to read pile right now!” It was serendipitous. Publisher’s Summary: Lily loves her half-brother, Adam, but she has always struggled with him, too. He’s definitely on the autism spectrum–though her step-father, Don, can barely bring himself to admit it–and caring for him has forced Lily to become as much mother as sister. All Lily wants is for her step-father to acknowledge that Adam has a real issue, that they need to find some kind of program that can help him. Then maybe she can have a life of her own. 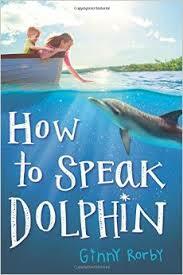 Adam’s always loved dolphins, so when Don, an oncologist, hears about a young dolphin with cancer, he offers to help. He brings Lily and Adam along, and Adam and the dolphin–Nori–bond instantly. But though Lily sees how much Adam loves Nori, she also sees that the dolphin shouldn’t spend the rest of her life in captivity, away from her family. Can Adam find real help somewhere else? And can Lily help Nori regain her freedom without betraying her family? 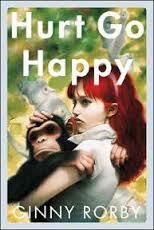 Ginny is also the author of Hurt Go Happy, which won a 2008 Schneider Family Book Award. Publisher’s Summary:Thirteen-year-old Joey Willis is used to being left out of conversations. Though she’s been deaf since the age of six, Joey’s mother has never allowed her to learn sign language. She strains to read the lips of those around her, but often fails.